Co-property 17 involved the total renovation of an apartment interior in Brevent – including a full re-wire and installation of a new heating system, giving the Pangea team a chance to demonstrate their expertise in navigating the complex legislation regarding developing within French apartment blocks. The 100m2 property was located inside a block with around 100 others, managed by a ‘co-property.’ As is standard in these cases, some potential changes to the interior, as well as any made to the exterior, must be signed off by the landlord – a complex bureaucratic process. 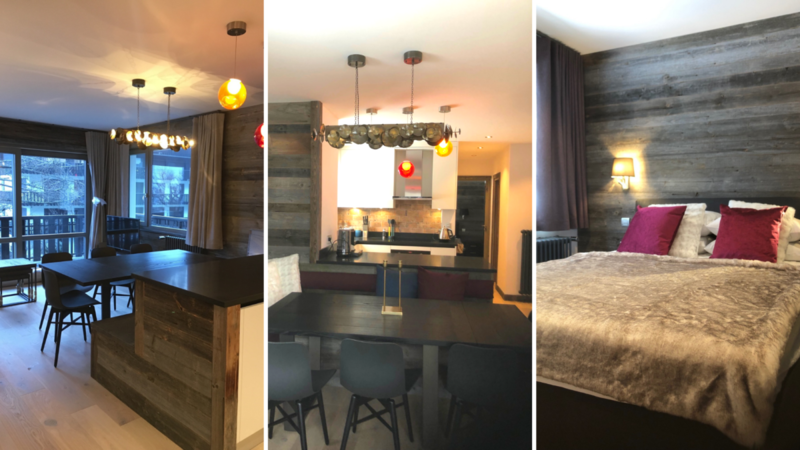 Thankfully Pangea have plenty of experience renovating within apartment blocks, having worked on the vast majority of co-properties in the Chamonix Valley already. Our clients find this experience invaluable, we can easily advise on what can and can’t be done to this kind of property, including specific restrictions regarding demolitions and time-of-year restrictions on modifications to the heating system. 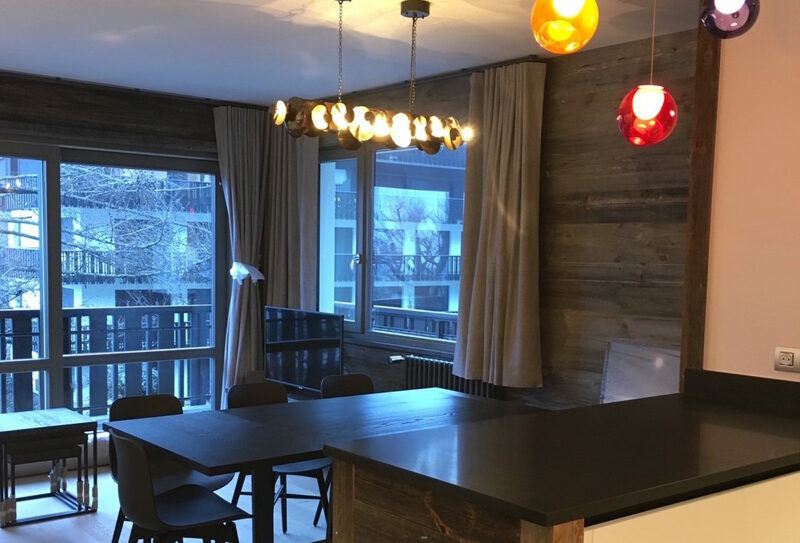 In the case of this apartment in Brevent, Pangea delivered a full turnkey solution. The medium sized apartment features an open plan lounge dining area, 2 bedrooms, 2 bathrooms, a kitchen and a guest WC. We completed a full strip back to shell and renovation within 5 months, delivering the project on time for use during the Christmas holidays of 2018. The dated electrics meant that the property required a full rewire to support the latest appliances and repositioning of sockets and fixtures. With the property stripped back to shell, Pangea arranged the installation of a completely new plumbing infrastructure, including hot, cold, waste and extraction systems. Complex liaison with the co-property building management was required for the replacement radiators, which were then connected to a home automation system. Co-property authorisation was also required for the external works, namely the modern, energy efficient replacement windows and doors. To fully modernise, we installed a domotics system, which is a popular home automation system allowing the owner to control lighting, climate, entertainment systems and appliances locally or remotely via a phone app. Underfloor heating was installed in the bathrooms and the lighting design added the final touches to a beautiful, modern apartment. The architectural interior required new internal ceilings and walls. Exquisite timber floors complemented wooden panelled walls and a bespoke fitted kitchen, including appliances. A theme of dusky greys and blacks ran throughout. Some rooms required wall/floor tiling, including a wet-room shower and a master bathroom suite. We worked with the client to deliver exactly what they were looking for in terms of interior furnishings, including storage units and bunk beds, creating an efficient and aesthetically pleasing space. 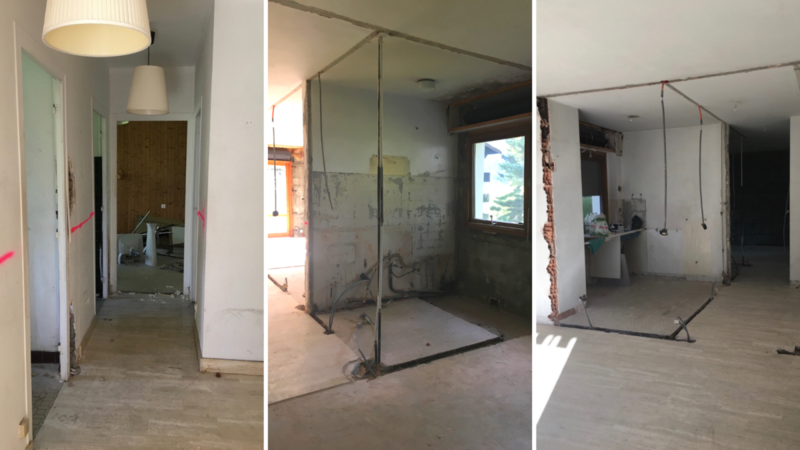 For many who are looking to improve a property in the Chamonix valley, especially those who do not permanently live nearby, keeping on top of a renovation project is nigh on impossible. We take the reins, offering a primary point of contact on the ground and overseeing the entire project from start to finish. This case study was a great example of our ability to work constructively with local actors such as co-property management, which can so often trip people up when they’re attempting to refurbish an apartment. Despite these challenges, we kept the project moving along smoothly, finishing on time and delivering exactly what our client was looking for.